VocalEssence educational programs are specifically designed to engage students (grades 4-12) who may not otherwise have opportunities to attend or participate in musical events. By putting music education in the context of these students’ cultures and communities, VocalEssence ensures that every student has an impactful, meaningful musical experience. Bring renowned choral experts into the classrooms—giving students the opportunity to learn directly from exceptional role models. 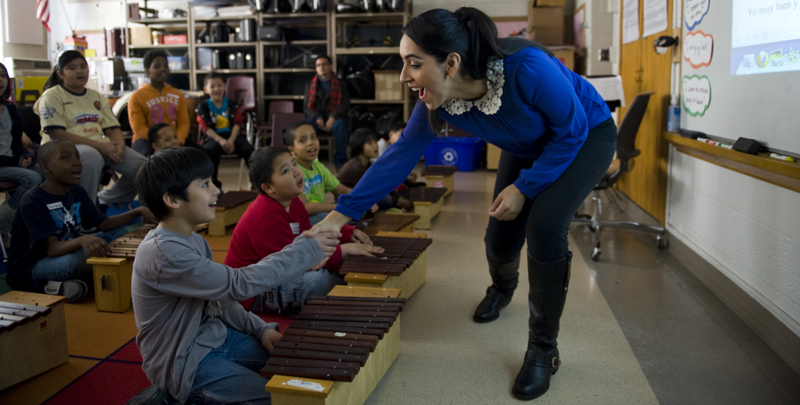 Blend music and the study of cultures present in Minnesota’s diverse school population. Provide opportunities to perform and attend performances in a major concert hall. Arm teachers with flexible, easy-to-use teacher guides and ongoing assistance. Help students achieve higher levels of self-esteem, self-expression, and engagement in the community. VocalEssence ¡Cantaré!—During ¡Cantaré! (Spanish for “I will sing”), Mexican composers lead students through an in-depth exploration of Mexico’s vibrant musical traditions. VocalEssence Lullaby Project—The Lullaby Project creates musical experiences for women facing pregnancy while enduring other hardships, such as teenage pregnancy, homelessness, or incarceration. VocalEssence Singers Of This Age (SOTA)—Young people from Minneapolis and Saint Paul high schools who sing, dance, write their own music, rap, and—most importantly—reflect the diversity of our community in its membership. VocalEssence WITNESS—Now in its 29th year, our WITNESS curriculum celebrates the artistic contributions of African Americans to the fine arts and to our common cultural heritage.